An Unfilled Attendance appears on your dashboard a set number of days after a lesson a lesson has been taught. The number of days is determined by your school ( If you want to fill lessons in as soon as a lesson takes place see below). After you click on date the attendance form will appear. For lessons with one of the above statuses the student attendance status must be “A” and the minutes worked “0”. 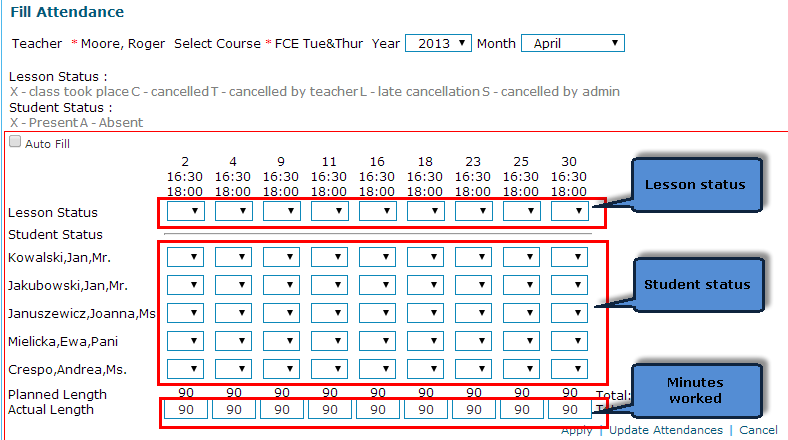 the student attendance status must be “A” and the actual minutes can be left as planned. the student attendance status can be either “X” or “A” and the actual minutes as taught. Lessons that are marked as L or X are used in teachers’ pay calculations. This will take you to the following page, where you can call up the attendance form and fill it in.